I’m sure you’ve seen them! Those bell ringers wearing red and big smiles at the entrance to your favorite store. They are ringing bells to get your attention (and your donation!) These folks are volunteers hoping to raise money for the Salvation Army so that the Salvation Army can serve members of your community. They are generally good people with a heart to help and they want to give you the opportunity to help too. Like you, I give money to all sorts of organizations, throughout the year, but there is just something special about being a part of the giving that takes place at that red kettle with the sound of bells in the background. Maybe it’s nostalgia or tradition, but there’s nothing like it. Fortunately, I have not ever needed the Salvation Army’s services, but I do look forward to supporting them each year. I am already planning my strategy. I hope you will too. I intend to do the largest part of my kettle contributions at my local store so that my donation goes to my closest neighbors in need, but I do not want to miss out on the joy of giving at other kettles along my way! This year, I hope you’ll join me as I pledge to practice the 5 B’s of Kettle Giving. Be Prepared – You know they are going to be there when you go shopping. Put some change in your pockets to quickly drop in. No fiddling with your purse or wallet and it won’t slow you down a bit. 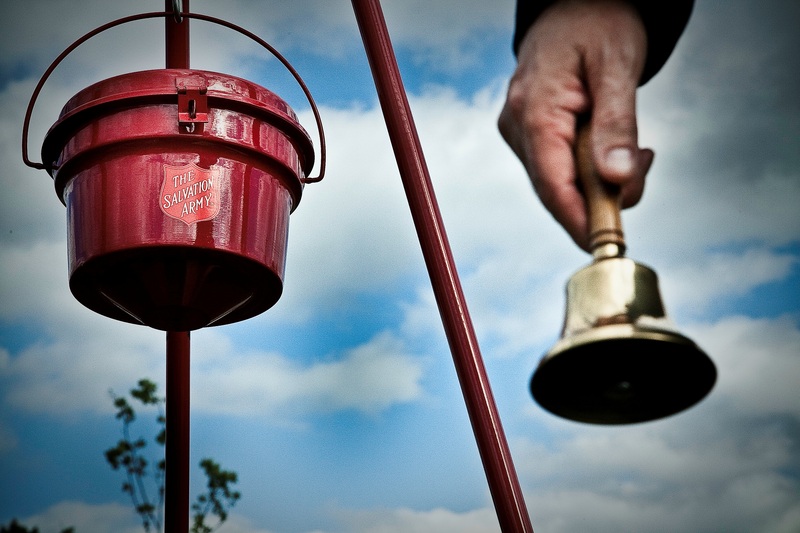 Be a Blessing – In addition to giving your coins, give your thanks to the person ringing the bell. You will be blessing them by donating, but you can also bless them by thanking them for their contribution too. Be Creative – Where will that cash in your pockets come from? Start now by giving this some thought. Stop spending your change and save it for the kettle. Clean off the top of your dresser, your dryer and under your couch, you may find some coins there. Check your old handbags, coat pockets and car ashtray. If your motive is pure, you’ll be surprised where this extra money can come from & you’ll be able to contribute. Bring a Friend! Encourage your friends to do what you are doing. Let them share in the spirit of giving. Teach your children to give and give them a change purse to take out with them. We can’t do this alone. Encourage others to join in! Be Kind. Even if you don’t have coins to drop in the kettle, greet the bell ringer with a smile and a “hello” or “Merry Christmas.” Don’t avoid eye contact. Just wish them well. I once walked by someone asking for donations and said, “Sorry I can’t help today.” He cheerily replied, “That’s ok. God Bless You.” Regardless of my lack of giving, his comment brightened my day. Even when you can’t give a donation, you can give a smile. Last year I had the opportunity to be in New York City during the Christmas Shopping season. My daughter and I had a wonderful time taking our pocket full of ones and seeking out the bell ringers to put in our donation. Instead of feeling awkward about not wanting to dig for a donation, it was part of our mission and it was fun! This year, I have been putting loose change into a piggy bank. I’m excited to go shopping with a pocket full of change to share. Join me! You’ll be glad you did!